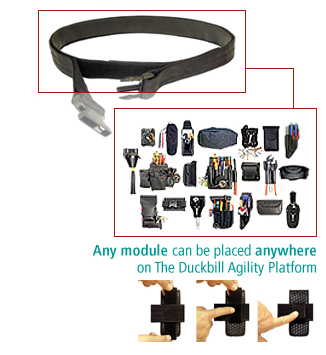 Duckbill's Agility Platform is an ergonomically sound tool and gear carrying solution for professional tradesman. 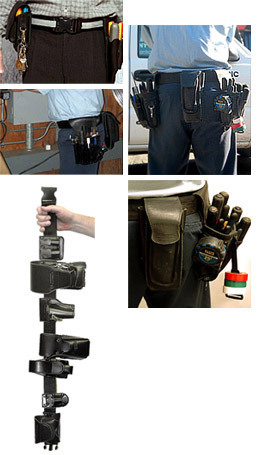 They've been engineered to meet the weight distribution and comfort needs of users such as warehouse and industrial maintenance crews who carry various tools, devices and instruments from keys to hand tools to meters to communications gear - and who require frequent and easy access to those tools they carry. Typically these users carry 6 to 12 pounds of gear for 4 to 12 hours each day. An outer and inner belt solution. The Duckbill Agility Platform incorporates the use of an inner Agility Anchor Belt and our Agility Outer Belt. The Agility Anchor Belt is a belt consisting of soft leather on one side and industrial Velcro® wool on the other. This belt runs through the belt loops of work trousers. Our Agility Outer Belt consists of a nylon outside and Velcro® hook underside. All Duckbill modules sync-up with the outer belt utilizing our patented MaxCon docking technology, then cross-links with the inner belt thereby creating 360° of connectivity between our modules and the users waist. Weight carried on the waist for a significant amount of time during the day causes pain. 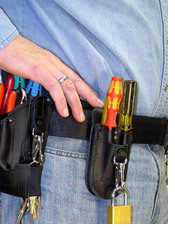 Typical tool belts and its uninhibited tool movement and casual or sloppy tool weight allocation of even 4 pounds of tools along and around the waist can lead to unnecessary neck, shoulder, back, hip and knee pain or Muscular Skeletal Disorders (MSD's) and eventually to premature personal health and enterprise productivity gaps due to time off of the job. This dual belt and module-driven solution allows for any task, and any tool mix to be used anywhere, anytime and with any positioning priority of the modules and tools because of the overlapping MaxCon clamshell design. Once a module is positioned on the Agility Outer Belt it will not shift, slide or move. And once the outer belt links with the inner belt, 360° of connectivity is obtained  thereby distributing all the gear weight completely around the users whole waist, not just at a few points like a typical tool belt tends to do. Our clamshell docking also allows for easy reposition of any module.